Continuing along in Blogging through the Alphabet, and this time I'm talking about one of my favorite parts of homeschooling my teens. Sometimes, those "discussions" are really lectures from Mama. Those aren't my favorites. Mostly, they really are discussions. 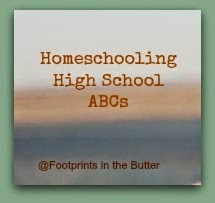 In our homeschool life, I have tended towards resources that give us a lot to talk about. I started off high school with Connor by switching that approach. You know, making him write out answers and do more textbooky things. That wasn't fun. For any of us. So we are back to a lot more discussion-oriented resources in our schooling. Now, in the interest of full disclosure -- one of my biggest failings as a homeschooling mom is that my children are going to struggle with college writing. So you might want to be a more responsible person and make your children write more. I am forcing myself to do that here this coming year. But that doesn't mean we'll slow down on the discussions. I mentioned in last week's post that I track time for English a bit differently from other things. I expect that my kids are doing their reading outside of "class time" and then we can use our "class" for discussions or for working on writing. That means that right now, my guys are reading The Two Towers on their own, and we are talking about the book using Literary Lessons from The Lord of the Rings. And that means, instead of them writing out answers to questions, we get to chat. Which leads to fascinating conversations about all kinds of things that matter. A recent question in the guide was "What is Merry's opinion of Saruman's courage? Why does he think Gandalf has more courage?" In our, oh, at least half hour discussion of this single question, we not only answered it (Saruman hides behind others, protecting himself and not caring about who else is hurt; Gandalf stands alone to protect those who are weaker) but we got into a huge discussion about where we see which type of courage today, or in history. That involved a discussion of Hitler, Washington, Stalin, Caesar, Obama, Napoleon, and on and on. We recently finished a course called Simply Put: A Study in Economics. This was an absolutely incredible resource for fantastic discussions. We've completed the course, and it is amazing how often the concepts we discussed in there are coming up in other subjects. In reading about the French Revolution, for instance, there was a comment about price controls. Because of the economics discussion a few months ago, we were able to get a bit deeper. It isn't really important what it is that we are talking about, just that we are discussing things. Having these deep conversations about history, science, literature, current events, or whatever -- these give me the opportunity to find out more about what makes them tick, what they value, and what they worry about. And it gives me a chance to talk about what I value, what I hope for them, and more. Discussion. My favorite part of homeschooling my teens. My next post, next week, is still a bit up in the air. I'm considering E is for Entomology, where I'll talk about trying to follow the interests of your kids. Marcy is posting a word study, and this week is D is for Delight. There are a few dozen other amazing D posts linked up too. Go check some out! Great post - the "discussions" are my favorite part of having teenagers in the house too! :-) It's fun to watch them start to work through life issues on their own, and hear what's going on in their brains.